Make sure you don’t make any of these mistakes with your guillotine cutter. If you use a guillotine cutter in the bindery, you may sometimes run into the average problem or two, just as you will with any machine. It’s important to know how to maintain all of your equipment as well as how to recognize certain common problems. 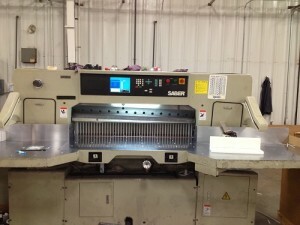 Here’s what to look out for if you use a guillotine cutter in your bindery. Standard Steel Knife Blade: lasts for about 8 hours or about 1,200 cycles. High Speed Steel Inlaid: lasts for about 16 hours or about 3,000 cycles. Carbide Knife Blades: lasts for about 10-20 times longer than the High Speed Steel Inlaid. There are other factors that play into how well your cutter functions. If your knife sharpening service isn’t sharpening the blades well enough, you can still run into the same problems, even after you’ve installed a new blade. Also, if you’re cutting through thicker materials, such as chipboard, then your knife blade will become dull faster than it normally would with thinner material. Soft Paper: 19 to 20 degrees with low clamp pressure. Regular Paper: 23 to 24 degrees with medium clamp pressure. Hard Paper: High angle or double bevel up to 30 degrees with a higher clamp pressure. This entry was posted on Friday, May 6th, 2016	at 3:27 pm	and is filed under Fixing problems	. You can follow any responses to this entry through the RSS 2.0	feed. Both comments and pings are currently closed.